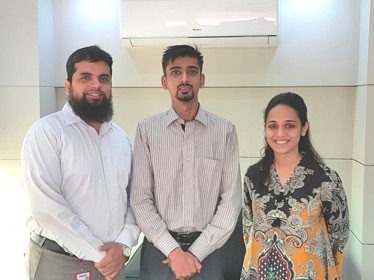 Ali Raza (center) stands beside our General Manager Recruitment, Mr. Sadiq Fareed and Recruitment Executive Ms. Almeenay Hussain. Ali Raza, a 29 year old, B.A pass looks just like any another ordinary young man looking to make a success of him-self and be able to support his family. Yet there is a difference, he is hard of hearing. He is one out of a shortlisted pool of “differently-abled” and just as talented as any other candidate that we have met and delighted to have on board. He joined us almost 8 days ago and has been working tirelessly and without much effort to assist us on data entry. “Initially there was a communication problem as none of us knew how to convey the instructions to him. Today, we see him as an integral part of our HR Operations team. He has great computer skills and needs very little monitoring now” said Ali’s supervisor Farhan Khan. If you are interested to find out more, please feel free to contact us on: info@primehr.com.pk or call us on UAN: 11 11 77463 (PRIME).